I am an avid hockey fan and would love to find a female companion to partake in some NHL games with me. Why do the only females I meet who like hockey look very, well, rugged? Also, to expand on this for those who currently have a girlfriend, how can you get them to enjoy this fantastic sport if they are currently opposed to it? Rachel's Take: Well hello, Confused Hockey Guy! In your email you state that you have, in fact, met female hockey fans. However, you’ve also dismissed these ladies simply because they are “rugged” looking. CHG, lemme tell you, it is HARD to look cute at a hockey game. 1. It's a bit chilly in there, and girls are always cold, so we have to dress accordingly. That means bulkier clothing or multiple layers, automatically contributing to that "rugged" look. 2. 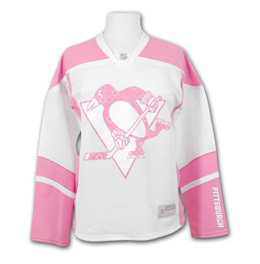 Have you seen the NHL hockey apparel marketed to women? It is an absolute tragedy. A quick perusal reveals t-shirts, tanks and tube tops (not warm enough), polos (awkward), sweatshirts (bulky), and the true gem...the women's hockey jersey, created "for the true female fan who is tired of hiding beneath a bulky men's cut jersey..." GREAT sentiment, I would love to have a jersey that fits! This could really be the breakthrough we women have been waiting for! "This brand new jersey will allow the female hockey fan to sport her favorite team with style and flair!" Style and flair? Weird, but ok.
"...featuring a screen printed team logo with sugar glitter." Sugar glitter? Wait! What is this thing?! A pink glittery jersey? This is hockey! And the team's colors are black and gold! 3. Women wearing men's hockey jerseys look rugged. There is little discernible indication of a lady's physique from beneath that tent of fabric. You could be looking at Miranda Kerr's or Roseanne Barr's bodies and struggle to tell the difference. Really. Give those "rugged" girls a shot. They might surprise you in street clothes. Change up your scene: Check out games at a few different sports bars. It's difficult to do while also paying attention to the game, but look for ladies watching the screen, reacting to calls, probably even yelling at the players. Utlize your networking skills: Host a party on game night. In addition to inviting your usual crew, consider inviting some casual acquaintances and encourage them to bring their friends. Someone is bound to know a cool, attractive, hockey-loving lady. Take advantage of "Guy's Night": Consider the possibility that having a girlfriend who doesn't like hockey is not the end of the world. Sure, it's nice to have common interests, but it's also REALLY nice to have a built in excuse to hang out with just the bros.
And in the meantime, continue sending questions my way!